I found plenty to keep me active in Bermuda that's known for its pastel-colored houses and tidy hedge-rimmed English gardens. But after walking the narrow streets of St. George's where 17th century buildings and a sense of British colonial history abounds, and then exploring the hidden coves and the soft pink sand of Horseshoe Bay, I sought out more leafy venues for walking, hiking and biking. That way I could learn about Bermuda's flora, including the endemic, as well as check out the bird species, because I heard that Bermuda is a great place for birding, almost year round. In the fall, in particular, Bermuda is the place where migratory birds rest on their way from Canada to South America. In addition, birders delight in spotting the rare petrel that was though to be extinct for hundreds of years. 1. Eighteen miles of rail bed once traversed by the Bermuda railroad (up until the late 1940s) have been converted to the Railway Trail. This path skirts the coastline, passes traditional manor houses and winds through woodlands, fields and a palmetto forest. Walk or bike even part of this secluded trail. 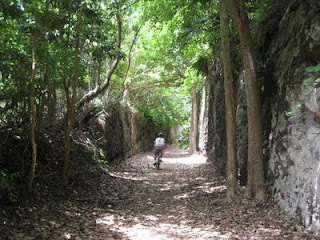 You'll be far from any street traffic -- the trail meanders along the coast at times, at other points you'll be under a canopy of foliage and pass old manor houses. Just be aware that it's westernmost part that's the easiest: relatively flat and mostly paved. And, to get the most out of your journey, try to pick up the Bermuda Railway Trail Guide available from the tourism offices on the island. 2. Spittal Pond has 60-some acres of unspoiled wilderness (actually protected wetlands) where you can bird watch - this green space is especially good to catch migratory birds -- or hike on densely canopied trails. (This green space may be the best birding spot in Bermuda). Nature or mystery lovers alike will delight in a trek through this woodland. Aside from herons, flamingos and other waterfowl, on your walk past cedar trees, ponds and along the coast, you'll find a giant stone "checkerboard" believed to be formed by water erosion and a plaque at Spanish Rock with cryptic inscriptions. The latter is said to offer the oldest piece of evidence for the island's habitation: Spanish sailors are said to have landed here in the 16th century. 3. In Paget Marsh you'll find two dozen acres dense with palmetto and cedar forests that exists much as it did before settlers first arrived. Here you can wander the boardwalk that courses past grasslands and mangroves and expect to find plenty of bird life, such as king fishers, warblers and great egrets, and maybe even a giant toad. 4. 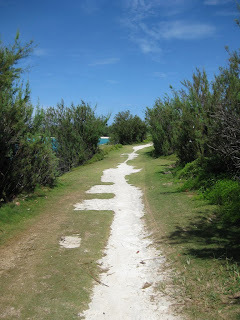 Hog Bay Park is almost 40 acres of expansive forest, farm land and coastal property that sports undulating trails where you can take in the panoramic scenery from a hilltop -- providing maybe one of the best viewpoints in Bermuda. This park has an amazing array of birding possibilities, with more than 100 different species spotted, including purple finches and olive-sided flycatchers. After all the trail hopping, you can cool off at the shore whether by snorkeling or swimming. 5. Allspice and cedar trees are clustered on the landscape that's home to Warwick Pond, one of the island's largest freshwater ponds and a key site for bird life, both migratory and resident. Here you can meander on trails that wind past fields, marshes and, of course, plenty of woodland. 6. The Bermuda Botanical Gardens is hardly a wild locale but still worth a visit. Set on some 36 acres where the aromas are intoxicating, the garden is home to than 1,000 varieties of plant life, from frangipani to a giant banyan tree. During your stay in Bermuda, if you'd rather hike with a group, check out the Walking Club of Bermuda that offers six-mile hikes or so with routes that change weekly. Hi Martha & Me, Bermuda is quite small: a mere 21 square miles or so. But there is still wonderful pockets of wilderness and green spaces to explore. I like the idea of hiking on your own versus with a group. These are great suggestions. Thanks. Birding is such an amazing way to see a country and really be in it and not just a tourist. What a fantastic idea to bird watch in Bermuda. Maybe you should write an article about this for Audubon?! Hi ReadyMom, I'm also a big fan of hiking solo or with a friend rather than a group which can distract from the immediate intimate experience. Thanks for your comments. Hi Jennifer, thanks for the idea of Audubon. I'll look into that. I was surprised how many people found it curious that I spent time bird watching in Bermuda. Of course, I did the beach activities as well, but it's nice to experience alternative activities. This sounds divine...what a way to see the land, sea and wildlife. I love it that you so often find the backroads and places travelers would otherwise not know about. Excellent post. Hi Ruth, I'm glad you enjoyed these and other posts. I always try to find the unexpected no matter how well traveled the venue. Thanks for your kind comments. What lovely images! You have a nice eye for photography, that's for sure.